My story goes back to my late thirties. I felt held captive by a chronic fatigue that I could not shake. I never knew from day to day if I would have energy for even mild physical activities. Even enjoyable things like dancing or raspberry-picking were often too exhausting for me to endure. My enthusiasm was dimming more and more. I felt anxious or depressed. But thankfully, a very lovely, elderly woman told me about the benefits of AIM’s barley grass powder. A hope was sparked that somehow nutrition could be a significant solution. Twice a day I took it while making changes in my diet. My energy level increased dramatically. Although I was no longer tired all the time, my fitness level was very low. However, I wasn’t in a place to even consider starting exercise before taking greens like AIM BarleyLife. A strong desire to be fit began to grow in me, so I bought a book on running and started out. I called my run the geriatric shuffle because I was ridiculously slow. But I loved it. My mood also dramatically improved with running. It was like I had come out from under a dark cloud into the sunshine of a brand new day. I made a wonderful running friend, and we began to challenge ourselves with various kinds of running: hills, sprints, intervals, long runs. It was so much fun. I was so relieved and thankful because the chronic fatigue was just a memory. When AIM LeafGreens came out, I began to take it, noticing an increase in stamina. My dear friend also took it with wonderful results. When I was fifty-two, my son showed me video clips of the Tough Mudder and Spartan races, both challenging events for physical fitness and stamina. Silent tears flowed down my cheeks as I watched, longing to be able to participate in such events. I wanted so much to be successful. I had heard some good things about the benefits of CrossFit, so I excitedly signed up. The overall physical benefits have been huge for me. Not only was I able to finish the Tough Mudder event with no problem, but I can participate in countless physical activities with fun and success. I gave AIM Red Rush a try after reading some testimonials and immediately experienced a boost in my workout. I would describe it as “my engine feels more powerful.” I am able to get a little more done a little faster without overdoing it. 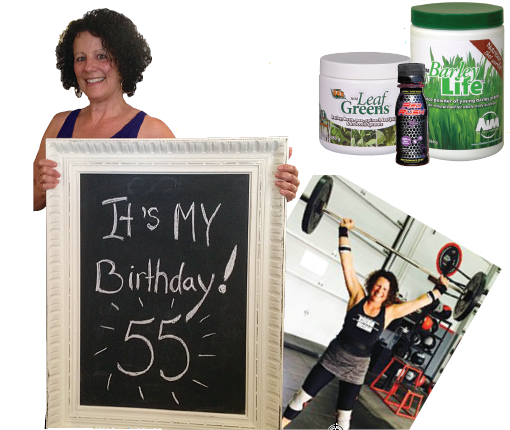 I am fifty-five now and find it fun and amazing that I am still growing and improving.